Unwraps an array of phases by eliminating discontinuities whose absolute values exceed either pi or 180. This input is available only if you wire a double-precision, floating-point number to input phase. Input array of phases to unwrap. Units for the input phases and unwrapped phases. This node uses similar equations to calculate unwrapped phase for the other units you specify in phase unit. 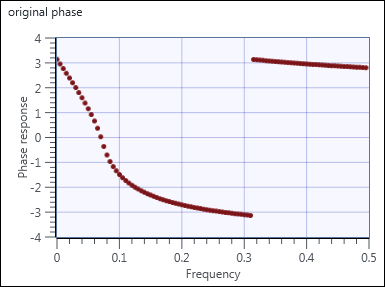 The following two graphs show the effects of unwrapping the phase. The first graph shows the original phase before unwrapping, and the second graph shows the phase after unwrapping. You can apply this node to the computed phase response of a linear time-invariant system. 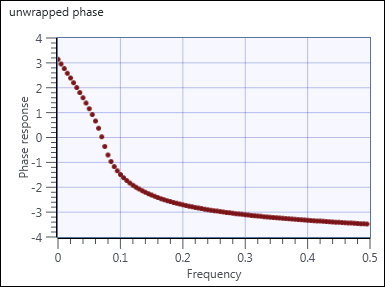 The phase response is defined as the complex angle of the frequency response of a system. You compute the phase response as angles within [- π , π ], or, in other words, as angles within one circle of 2* π radians. Because multiples of 2* π wrap when you compute the phase response, often there are discontinuities in the phase response from one frequency bin to the next.